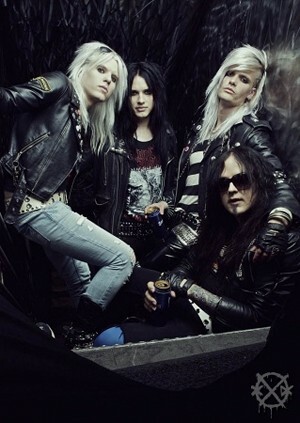 A leading force in the Swedish ‘sleaze rock’ scene of the 2000’s — CrashDiet, Stockholm’s sleaziest rockers, arrived in the UK to support Wednesday 13 and Michael Monroe’s latest tour. Admittedly, the band have sailed many a stormy tides since forming in early 2000 — with a brief split in 2003, the death of their first singer Dave Lepard, and the departure of their second, Reckless Love’s Olliver Twisted. But with a third singer now firmly in place, the band is back and ready to take the world by storm. Sleaze Roxx: You’ve just played America! Did you think you would ever achieve this as a band and how was it for you? Simon Cruz: Sure that was our goal… well, most bands’ goal I think. To get to play Hollywood and a full house… it’s great. Sleaze Roxx: Hanoi Rocks are considered one of your biggest influences, how does it feel to be on tour with Michael Monroe? Have you ever performed with him before? Peter London: No we haven’t performed with him before. But it’s probably me that is most influenced by them, it’s awesome! So yeah, I’m very happy about that, to be playing with him. Sleaze Roxx: You recently toured Australia, what inspired the acoustic sets over there? Eric Young: We always try to do that because when we have shows, mostly it’s only possible to do shows for people over 18. So when we can and have the time, and if someone wants to do it with us, we always try to do the acoustic thing — especially when we are overseas in New Zealand or something like that, so the younger fans can come and see us playing. It gives them something special when we do the acoustic set and it’s always fun. Sleaze Roxx: How did you get Mick Mars to feature on the song “Alone”? That’s a BIG name right there! Eric Young: He called the guy, that called the guy, that called the guy, and our guy called us (laughs). His management contacted our management because he wanted to write music with other people outside of Motley Crue. So our name popped up and Martin Sweet spent a day with him working on it. Sleaze Roxx: Swedish is your first language and all your songs are in English, was it your intention to take the band around the world having used a globally recognized language? Simon Cruz: Most bands in Sweden sing in English, I’m not sure why, but I think that’s the reason yes. I think most bands want to expand and take over the world. Sleaze Roxx: How did Simon ‘Simme’ Cruz come to the band after Olliver Twisted’s departure? Simon Cruz: I called Martin up and I heard they were looking for a singer, so I said let’s try something out. I went for an audition and I tried “Riot In Everyone” — that was the first song [I played with them], and we went out drinking — you know, all the things you need to do to make sure it works. Then we started writing songs together and stuff like that. We had quite a long time before we decided anything, but it worked out really well for everyone. Sleaze Roxx: What was the inspiration behind the choice of bands that featured on the ‘Reborn In Sleaze: A Tribute To Dave Lepard’ album? Eric Young: It wasn’t us controlling that; it was someone else doing that tribute thing. Peter London: An Italian guy put it together. Eric Young: We mostly heard it when it was all done and it was a really cool thing that they did with it. Sleaze Roxx: What did you think of the Tribute album? Eric Young: Yeah I liked it — it’s always interesting to hear covers. It’s not only that CD but it’s like on YouTube, we hear people covering our songs all over the world, so it’s always really interesting to hear stuff like that. Some are better than others you know, but that’s the way of life (laughs). Sleaze Roxx: Can you talk a bit more about the Dave Lepard charity? Eric Young: That’s something his Mother is running. It mostly seeks up and coming bands and she’s trying to help them out basically — those that have struggled to get equipment or book shows and so forth. She’s doing a festival each year, I don’t know if she did it this year, but will hopefully do one next year. She takes on bands that she sees fit to play the festival which is called ‘Rest In Sleaze,’ and the winner she perceives most deserving of the award [at the end of the festival] wins! And they can buy equipment and things like that with it. Sleaze Roxx: Have you started to write or record anything new? Eric Young: We’ve dabbled! But we can’t give much away, because it’s at a really early stage at the minute. Sleaze Roxx: What can fans expect from the new album, will you be maintaining the same sleaze glam sound? Eric Young: Yeah, were gonna stick to the CrashDiet sound. 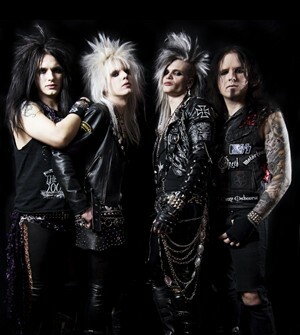 Sleaze Roxx: Have there been any specific bands that have provided influence on the next CrashDiet album? Eric Young: For the most part, for me, no! Simon Cruz: There are lots of Swedish bands with our sound that were popping up, like from 2008. I like Sister but they’ve gone more into Wednesday 13 kind of sound now. But I guess our main influences are from the 80s metal theme. Sleaze Roxx: How does Simme get his hair like that? Simon Cruz: We got this powder it’s called ‘Osis’ and it’s dusted. You put it at the roots first, and you spray hair spray, and then back comb it. Its Swedish hair spray, it’s very strong, and it’s like Viagra for the hair. Sleaze Roxx: What do you like to do to prepare for a gig? Eric Young: We try to warm up if we have the time. Simon Cruz: We have a hand shake which we do like this (everyone puts hands in centre together). Eric Young: Sometimes we warm up with beers and shots and stuff like that or sometimes we just go on stage. Sleaze Roxx: Have you been approached to play any UK festivals next year? Do you think that touring with Wednesday 13 may enable you to achieve that? Simon Cruz: I hope so, but I don’t know yet. Eric Young: I think there’s something but were booking things as we speak. Simon Cruz: It’s fun to play Download of course. Sleaze Roxx: Peter, you recently mentioned on FaceBook that you gave up nicotine. Congratulations, is there anything else you are thinking of giving up? Peter London: I have almost given up on beer yeah, compared to what it used to be like, but I guess food is next on my list. I would like to give up on food because it makes you fat you know so we will have to see how that goes.